To receive event notifications, please download the US Sailing Hempel World Cup Series Event App from the app store. Paine put himself in a difficult spot when his start didn’t quite go as planned. Fortunately Kaynar didn’t shine off the line either and both were quickly forced to make clearing tacks and work the right side of the course while the bulk of the fleet streaked off toward the left. While the Medal Race is short, there’s still plenty of opportunity to come back from a bad start as the smaller fleet—10 versus 26 boats in the case of Finn class—makes it easier to find clean lanes. Paine was patient, working past Kaynar on the first beat and then making the decisive move on the final run, slipping past Max Salminen (SWE) and Tapio Nirkko (FIN) to put two boats between himself and Kaynar and claim the silver medal. As the top-placing American in the regatta, Paine also earned US Sailing’s Golden Torch Award. The only other American team to sail on the regatta’s closing day was the Men’s 470 team of Stu McNay (Providence, R.I.) and Graham Biehl (San Francisco, Calif.). McNay and Biehl sailed together in two Olympics, but Biehl retired from Olympic competition after the 2012 Olympics and McNay teamed up with David Hughes (Miami, Fla.) to finish fourth in Rio. With Hughes recovering from a knee injury, McNay called upon his former partner to help him stay sharp. While a seventh-place finish—they moved up one spot with a third in the Medal Race—isn’t up to McNay’s usual standards at this event, which he’s won three times, but the team’s goal this week wasn’t focused on the results. Luke Patience and Chris Grube (GBR) just needed to beat one boat to lock up the gold medal in the Men’s 470 division. They beat eight, finishing just behind Panagiotis Mantis and Pavlos Kagialis (GRE) in the race. Kevin Peponnet and Jeremie Mion (FRA) finished seventh in the Medal Race, but were close enough to Anton Dahlberg and Fredrik Bergström (SWE) to hold onto the silver medal position. If there was a common thread to the five Medal Races on the final day of the 2018 World Cup Series Miami, USA, it was that the hard work put in early in the regatta was the key to victory. In three of the five classes, the leader coming into the day was assured or all but assured of the gold medal due to the advantage build up during the full-fleet portion of the regatta. The leaders in the other two classes had solid, if not invincible, cushions over second place. All five class leaders going into the day stood on the top of the podium at the end of it. But there was plenty of excitement when it came to the remaining podium positions. It was the final race of the day, in the Women’s 470 class, that proved to be the most entertaining. Regatta leaders Tina Mrak and Veronkia Macarol (SLO) gave the fleet a hint of hope by rounding the first mark in fourth. But an impressive run, which vaulted them into the lead, all but squashed any chance of another team closing the 13-point gap. The real battle settled on silver and bronze, with three teams—Afrodite Zegers and Anneloes Van Veen (NED), Agnieszka Skrzypulec and Irmina Mrózek Gliszczynska (POL) and Ai Konda Yoshida and Miho Yoshioka (JPN)—separated by 3 points going into the race and a fourth, Amy Seabright and Anna Carpenter (GBR), with an outside chance should two of the three falter. The race turned at the bottom of the second run when Zegers and Van Veen ran into equipment issues with their spinnaker, which required Van Veen to come off the trapeze and spend a few minutes inside the boat. In the breezy conditions, this proved fatal as the fleet streaked away from the Dutch team. The Polish and Japanese teams matched each other for the second lap of the race, with Skrzypulec and Mrózek Gliszczynska maintaining the advantage and locking up the silver medal. With a 10th place in the race, Zegers and Van Veen, the defending champions at this event, dropped from second to fifth. Seabright and Anna won the Medal Race and jumped to fourth in the overall standings. The Laser Radial was the most wide-open of the five classes, with nine of 10 sailors starting the Medal Race mathematically alive for a medal. Alison Young (GBR) had a five-point advantage over second place starting the day. But the way that Young closed the regatta—with four wins in five heavy-air races—there didn’t appear to be much chance to unseat her at the head of the class with the Medal Race being sailed in much the same conditions as the previous six races, 16 knots and choppy seas. With the gold medal locked up courtesy of a 30-point advantage, Tom Burton decided to use the Medal Race to work on his starts. All evidence to the contrary—his results for the week include two race wins and eight top-seven finishes—Burton wasn’t quite satisfied with his ability to get off the line. That item will remain on his worklist as he pulled the trigger just a hair early in the Medal Race and was called OCS by the race committee. Without anything to gain or lose, Burton was content to follow the fleet around the track after re-starting. He finished ninth and still winning the class by 17 points. Nick Thompson (GBR) and Philipp Buhl (GER) were effectively tied going into the race. And Sam Meech (NZL), the bronze medalist from the Rio 2016 Olympics, was lurking just three points back. It all looked good for Buhl (right, in red) when he rounded the first mark in sixth, with Meech in sixth and Thompson (right, in blue) in ninth. But Thompson, who was whistled for a tacking-too-close penalty on the first beat, ground back into contention. It was anyone’s race as the Lasers surfed down the final downwind leg, flicking their bows from side to side and aggressively working the short, steep chop of Biscayne Bay. In the end, Thompson was unable to dig himself completely out of the hole created by his penalty on the first leg. Like many Olympic veterans in this regatta, however, Thompson is able to look at the big picture. “Today was a real tricky day in Miami,” said Thompson. “I was tied with three boats going into the medal race. First place was already gone. I knew it was going to be a tough battle but, in the end, I came away with third place. It’s another year where me and Philip had a good battle. I like competing with him. He’s a great sailor. Miami, USA has delivered a range of conditions for the 543 sailors, from 50 nations, competing in Round two of Sailing’s World Cup Series 2018. With the wind and sea state failing to moderate during the day, at 1:30 p.m., the 49er, 49erFX and Nacra 17 fleets were told they would not be sailing on Day 4 of the 2018 World Cup Series Miami. A similar message to the other seven fleets participating in the event followed later in the afternoon. “We had some hope because yesterday the forecast indicated that the wind strength would drop at midday but it didn’t,” said Antonio Gonzalez de la Madrid (ESP), World Sailing’s Technical Delegate for the regatta. “Instead it increased and the average was above 25 knots. In the afternoon the average wind strength was 27 to 28 knots and gusting up to 35 knots. “World Sailing’s Race Management policies prioritize fairness and safety when conducting races. The policies recommend not starting a race when the wind is above 25 knots and this is reduced to 22 knots for the 49er, 49erFX and Nacra 17 when the sea state is rough. For five of the fleets competing this week—the Nacra 17, 49er, 49erFX and Men’s and Women’s RS:X—today marked the end of the full-fleet portion of the regatta. The top 10 in the overall standings going into the day will advance to tomorrow’s double-points Medal Race, which will decide the overall podium positions. While the Medal Race has been a part of Olympic sailing for more than a decade, opportunities to participate in one are inherently limited by the format. And it’s different enough from a normal race—the course is shorter and features on-the-water umpires. So sailing in a Medal Race is a valuable experience even for those athletes who may not have a chance at the podium in this event. The five remaining classes—Laser, Laser Radial, Men’s and Women’s 470 and the Finn—will finish their full-fleet series tomorrow and sail their Medal Races on Sunday. The wind is expected to remain strong. For those sailors who struggled in the light air on Day one and Day two, or had a tough result yesterday, it’s a chance to put those scores behind them and focus on moving up in the rankings. Winds speeds will increase and rougher sea state will develop on Day two of Sailing’s World Cup Series in Miami, USA. Wind speeds are set to increase today and for the rest of the week. The wind direction will be arriving from the north and will gradually swing to the northeast as the day moves along. The expected wind speeds will range from 13 to 17 knots, providing a change for the 543 sailors from 50 nations competing. PORTSMOUTH, R.I. (November 2, 2015) – Online entry to Sailing World Cup Miami 2016 Presented by Sunbrella is open. US Sailing’s premier event is set to return to Miami, Fla. for top-level Olympic and Paralympic class racing. The event is the only North American regatta to be included in World Sailing’s 2015-16 Sailing World Cup series. The regatta is a mainstay on the winter circuit for sailors campaigning for the next Olympic and Paralympic Games. The deadline for priority entries with regards to quotas is December 4, 2015. Entries must be received by January 4, 2016 to qualify for early entry fee and will not be accepted after January 24, 2016. Competitors and coaches are required to register online, as on-site registration will not be available. Additional fees will apply for entries received after the deadline. Competitors in the Olympic and Paralympic classes will have five days of fleet racing from Monday, January 25 to Friday, January 29. Medal Races across the 10 Olympic classes will bring the regatta to a close on Saturday, January 30 where medals will be awarded to the top three boats. Regatta Headquarters will be located at the US Sailing Center Miami, a U.S. Olympic Training Site, in Coconut Grove, Miami, Fla. Additional hosts for the event include the City of Miami’s Regatta Park, Coconut Grove Sailing Club and Shake-A-Leg Miami. These sailing organizations host classes onshore, as well as help run the on-the-water racing. The Coral Reef Yacht Club hosts the Opening and Closing Ceremonies and is the site for the Regatta Village throughout the week. Event winners in each Olympic class from Sailing World Cup Miami will qualify for the 2016 Sailing World Cup Final, while the best placed ‘home continent’ sailor will also qualify. 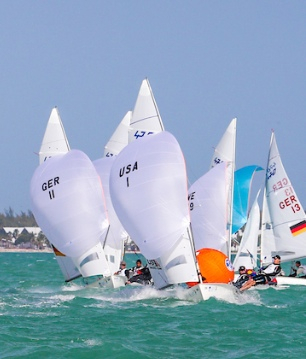 Several countries will use Sailing World Cup Miami as an Olympic and Paralympic Selection event, including the United States, with the results in nine classes contributing towards Rio 2016 selection for American sailors. The event is also an Olympic Qualifier for countries in North America and South America. The regatta has significant ranking implications for sailors hoping to qualify for the US Sailing Team Sperry, the U.S. National Team, which annually distinguishes the top American sailors in each Olympic and Paralympic class. Sailing World Cup Miami is presented by Sunbrella, and sponsored by Beneteau, Jeanneau, Lagoon, Sperry, Chubb Personal Insurance, City of Miami, Harken, McLube, Coral Reef Sailing Apparel, UMiami Health Sports Medicine, Switlik, Sturgis Boatworks, and Vetus-Maxwell. Established in 1990 by US Sailing, Sailing World Cup Miami Presented by Sunbrella annually draws elite sailors, including Olympic and Paralympic medalists and hopefuls from around the world. The regatta is open to boats competing in events chosen for the 2016 Olympic Sailing Competition and the 2016 Paralympic Sailing Competition. The 10 Olympic classes are: Laser Radial (women), Laser (men), Finn (men), Men’s and Women’s Windsurfing, 49er (men), 49er FX (women), Men’s and Women’s 470, and Nacra 17 (mixed). The three Paralympic classes are: 2.4mR (open, disabled), SKUD-18 (mixed, disabled) and Sonar (open, disabled). In addition to being a Sailing World Cup ranking event, the regatta also will aid in selecting members of the 2016US Sailing Team Sperry. 2016 Registration will open on Friday, October 30, 2015 at 5:00PM GMT (1:00PM EST).